I love everything that Curtis Hanson does, but Wonder Boys is basically my favorite movie about teaching. Most of us are not of the “Captain, My Captain” variety of teacher of Dead Poets Society fame. Some are. I’m not. Instead, I think most of us in the academy are like everybody else: wounded and screwed up, limping along, too dependent on something bad for us to get us through the night. Sometimes we run out of stories to tell; we get burned out. We don’t fit in. We do the wrong thing, hurt people, try to do good work, and then fail. Still, we can’t stop. We can try telling a dishonest story but if we are authentic scholars, we can’t make that work either. Despite it all, there’s one student who is just as outside as the rest of us, and that person has something to say, and there’s something important to him about all the walking wounded who have come before him. Teaching and creating art are messy, unpredictable, and often sad processes that nonetheless can yield glorious results. 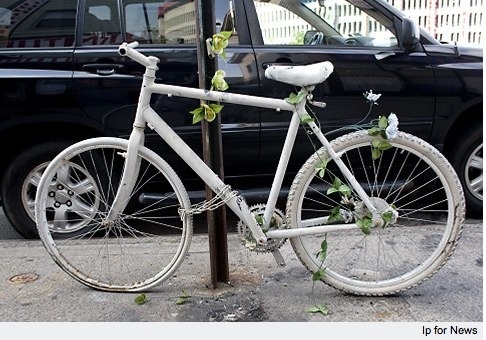 City nixes plan to remove ‘ghost bike’ tributes after outcry from families of dead cyclists. I have to admit to being somewhat torn about the ghost bike question. Of course memorializing bicyclists is important, but the space-consumptive nature of the ghost bike in the public sphere is off-putting to me. Ghost bikes do take up space where it is as a premium, and the reason why the bike advocates think it’s great is the same reason I pause over it somewhat: the in-your-face-there’s-a-victim-of-a-vehicle who died here. Fine, I get that. But where are the very public, very prominent memorials for pedestrians who die the same way? Or the public memorials for homeless people who die on the streets? Of course we want safe streets. Absolutely. But why are bicyclists entitled to very public, and I guess now we’re supposed to allow them to be permanent, displays of mourning when others, also arguably victims of unsafe streets, are not? It is not enough to have a politics that has “public mourning” as its final goal. The point of public mourning is to expand our ideas of what constitutes a livable life, to expand our recognition of those lives that are worth protecting, worth valuing. This is, importantly, not an individual activity, but something that not only happens in public, but has the power to redefine the public sphere. One of my favorite colleagues, David Sloane, wrote his dissertation on cemeteries and memorials, which he then published into an absolutely wonderful book on cemeteries and cities, which gets into the politics of prominence of mourning and the use of urban/rural space for memory. Sloane, D. 1991. The Last Great Necessity: Cemeteries in American History. John Hopkins University Press.